Problems on achieving maximum voltage drop within an installation come up often. Depending where you live, local regulations will have different limits on maximum allowable voltage drop, however the intent of all of these is to ensure sufficient voltage is available at the equipment so that if functions correctly. Specified voltage drops are generally not for an individual cable but for the full installation; from the point of supply connection to the final equipment. Thus the overall voltage drop is a combination of individual voltage drops across multiple cables. What becomes obvious is that the voltage drop is a function of the overall system and not trivial to calculate; particularly for a large system. In order to accurately determine the voltage drop to any load, a complete understanding of the system is required. Due to this, design is often carried out using computer software which can quickly evaluate the full system and provide a verifiable solution. Consideration of a common problem where the voltage drop exceeds the allowable, may help illustrate some of the issues likely to be encountered. Given a voltage drop which is too larger, this could potentially be resolved by increasing the size of the cable from the FDB to the load. Increasing this cable may work or could possibly result in a cable which is too large to be practical. An alternative would be to consider increasing the size of one or more of the cables in the upstream circuits, with the possible benefit of reducing cable sizes on multiple other circuits downstream of this. Voltage drop and the installation cabling system are integrated and tied together. 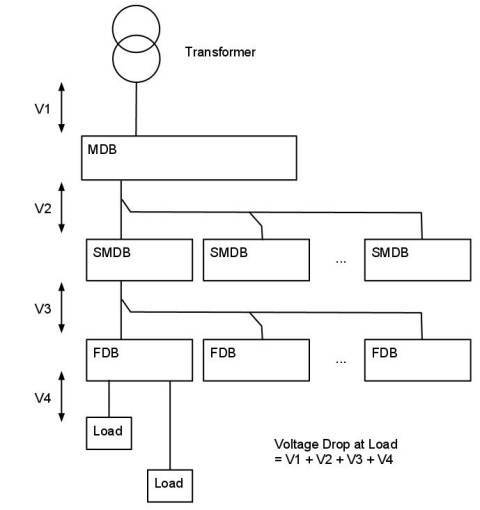 The example illustrates that consideration of the voltage drop requires a full understanding of the system. Other aspects of the design complicated this further. These include consideration of the cost of the installation, system losses and carbon footprint. By minimizing the amount of copper [cable] used these aspects are reduced, but this needs to be tied in with achieving satiable voltage drops. Attempting to address all these aspects with numerous combinations of different cables and what-if type scenarios can only be realistically addressed by using some sort of computer program. Allowable voltage drops for lighting circuits varies depending on country. A common figure in some countries I have worked is 4% or 5%. In the UK it is 3% if supplied from a public LV system and 8% if from a private LV system. In most buildings motors are relatively small and if the electrical system is correctly designed should not have an effect on the lighting. If the motors are large and/or the system poorly designed then voltage dips could affect the lighting. Offhand I can’t give further general guidance and would need to do a little research and look at voltage variations allowed by the manufacturing standards. Maybe someone else who has had recent experiences of motor starting affecting lighting will share them here. In the UK and Ireland there are different volt drop values for different installation types, i.e. the millivolt/amp/metre for single phase AC 50Hz cables in conduit is different than that for the same cables lying flat on cable tray. Not being party to how they arrived at the table, this is assumption but I would guess two reasons - minor variations in resistance and larger variations in reactance (inductance). ac resistance - the dc resistance should be the same in all cases. For ac there is skin effect which they may have included. This does depend on the geometric arrangements of conductors and would explain the variations in resistance. It is an interesting topic and at some stage I'll do a post on calculating ac resistance taking into account skin effect. reactance (inductance) - this is very much dependant on the geometry of the cable arrangements. As you move cables apart the inductance will increase, change their geometric relationship to each other the inductance will change, etc. Note: the mV/A/m is really mΩ/m so we are talking about impedance. I need a simplifyed calculation of voltage drop in relation to wiring of premises.